Condition : Very good, French polished – needs a little work, beautiful Steinway tone, excellent tuning. Overstrung. Restored 20 years ago. An investment. Steinway & Sons was founded in 1853 in New York City, by German immigrant Heinrich Engelhard Steinweg (later Henry E. Steinway). Steinway grand pianos are quite simply considered to be the finest pianos in the world. They are the piano equivalent to the violin’s Stradivarius. Heinrich Engelhard Steinweg’s dedication was: “To build the best piano possible”. He established at his company three basic principles: “Build to a standard, not a price”, “Make no compromise in quality”, and “Strive always to improve the instrument”. Research and inventions by the company have earned it so far around 130 patents, a greater number than any other piano company. Great pianists of the past and some active pianists today have expressed a preference for Steinway pianos produced in New York City or Hamburg. Vladimir Horowitz played a New York model D-274; Arthur Rubinstein preferred the Hamburg model D-274. 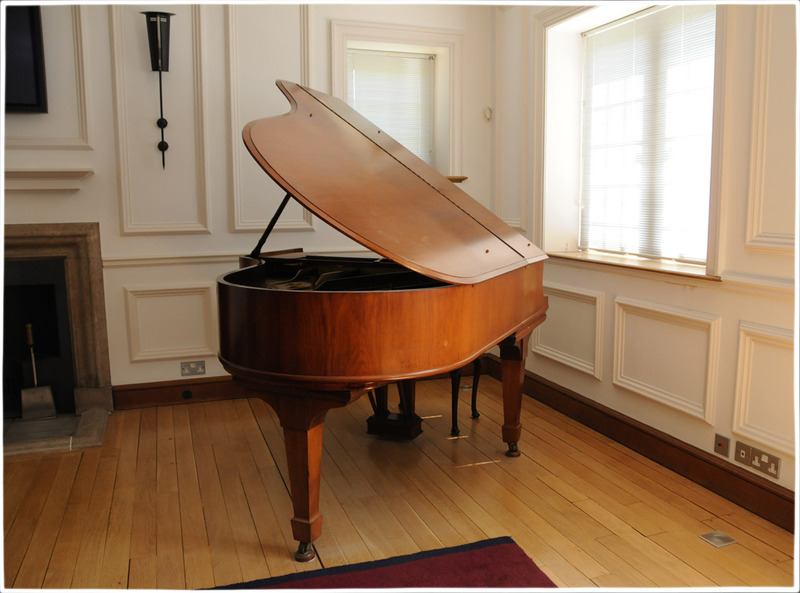 Sergei Rachmaninoff owned two New York models in his Beverly Hills home and one New York model D-274 in his New York home; however, he chose a Hamburg model D-274 for his Villa Senar in Switzerland. The New York and Hamburg factories exchanged parts and craftsmanship in order to “make no compromise in quality”. Each Steinway grand piano consists of more than 12,000 specific parts assembled by 450 people. A Steinway piano is handmade and takes a year to build. The cases are made of multiple laminations of hard rock maple. 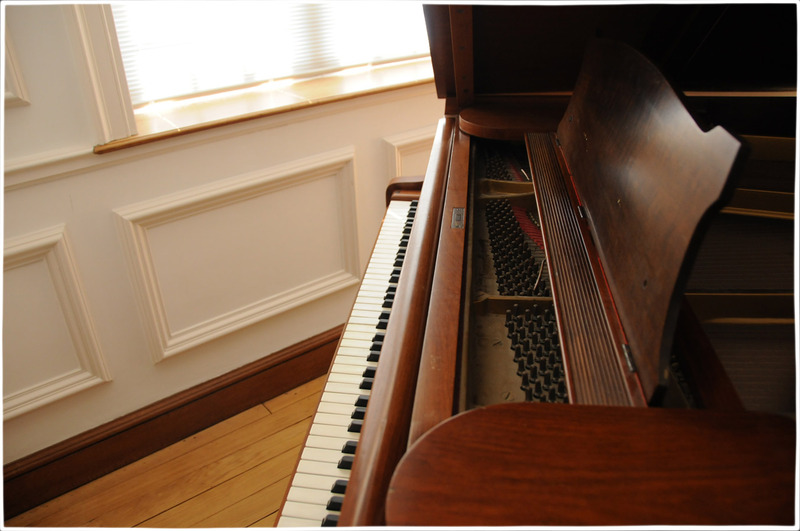 Strong beams in the bottom of the grand pianos or in the backs of the vertical pianos provide additional support. The patented process used to make the Steinway rim (called rim-bending) was invented by Steinway in 1878. The process is strictly adhered to today, more than 130 years later. 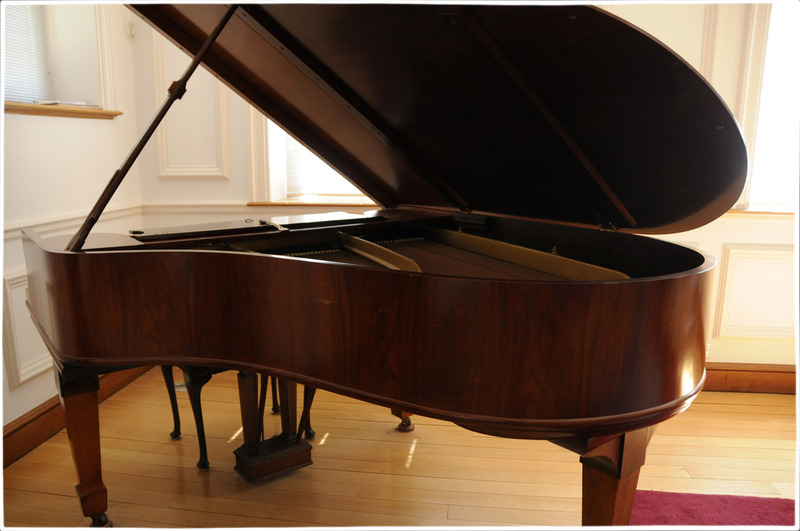 For braces and posts, Steinway pianos use spruce, a wood known for its tensile strength. After the rim-bending process, the rim has to “relax” from the tremendous shock of being bent. It is placed in a conditioning room between 10 and 16 weeks, depending on thickness and size of the rim. The room’s temperature is set at 85°F (30°C) and the relative humidity is 45%. 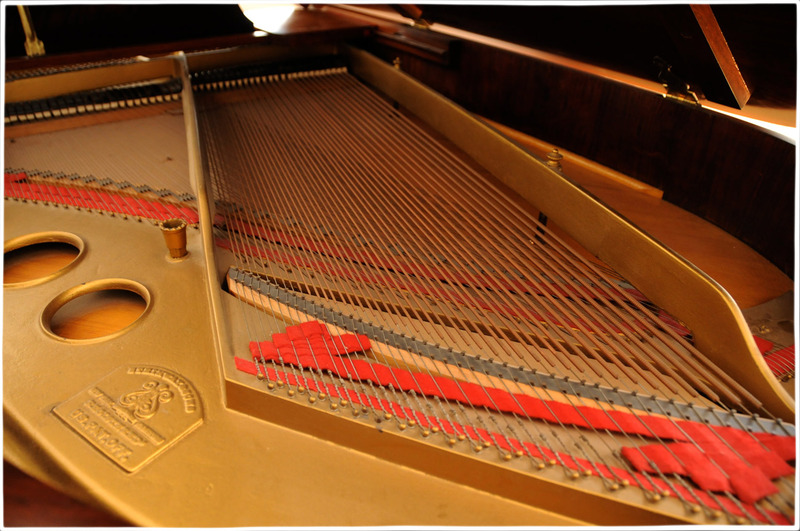 Inside the piano, a cast-iron plate provides the strength to support the string tension of 20 tons. The iron plate is installed in the case above the soundboard and is bronzed, lacquered, polished, and decorated with the Steinway logo. The soundboard converts the vibration of the piano string into audible tones. Steinway crafts the soundboard from solid spruce, which allows the soundboard to transmit and amplify sound better than other woods. The soundboard has a curved crown to provide the proper pressure against the string for maximum sound projection. Ribs are placed on the underside of the soundboard in order to maintain the crown, distribute tone along the soundboard, and provide strength. 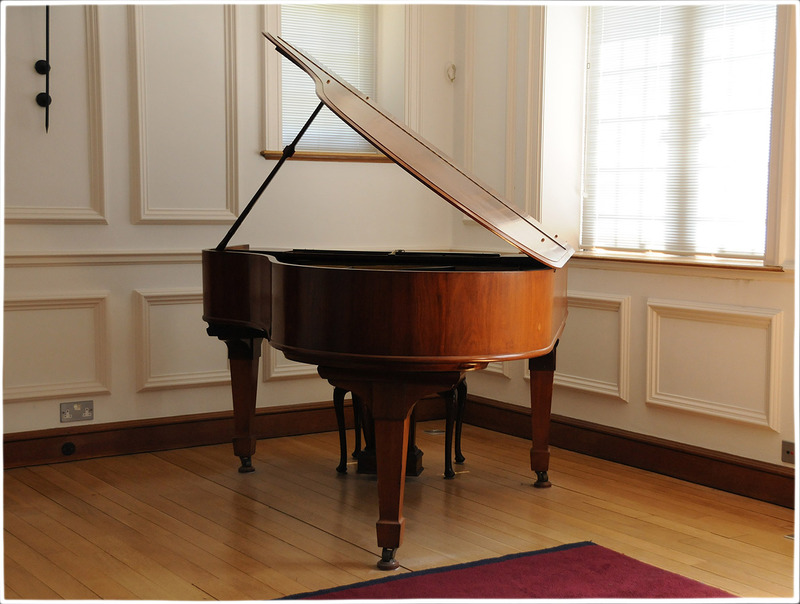 A Steinway grand piano has between 230 and 264 strings – between one and three strings for each of the 88 notes. Steinway uses three strings for tenor and treble sections and uses single and double strings for the bass. The bass strings are “overstrung” above the treble strings to provide more length and better tonal quality. Treble strings are made ofsteel, and bass strings are made of copper-wound steel. The strings are all uniformly spaced with one end coiled around the tuning pins, which in turn are inserted in a laminated wooden block called the pin-block or wrestplank. The tuning pins keep the strings taut and are held in place by friction. 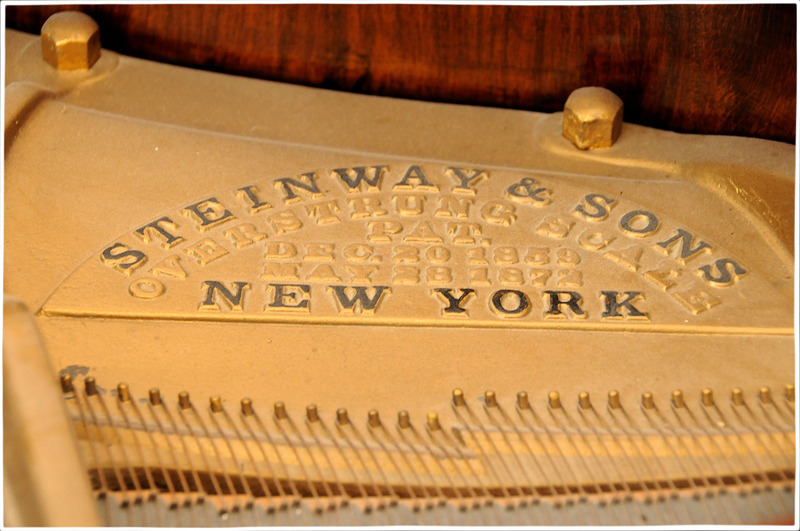 Each of Steinway’s 88 keys is made of Bavarian spruce. Each of the keys transmits its movement to a small, felt-covered wooden hammer which strikes one, two or three strings when the note is played. The hammers are evenly-aligned and have the ability to reset quickly and repeat any note rapidly. Dampers are felt-covered action parts which, when placed against the strings, dampen the vibration. The damper pedal raises all of the dampers, which allows sound to continue even after the key is released. Steinway grand pianos have three pedals. The right pedal is called the damper pedal or sustain pedal, and acts to sustain tone. The left pedal is called the una corda pedal (literally “one string pedal”) or “soft” pedal; when it is depressed, the keyboard action shifts slightly to the side, causing the hammers to strike the strings differently, thus softening the note. The middle, or sostenuto pedal, sustains a single note or group of notes without sustaining subsequent notes played.